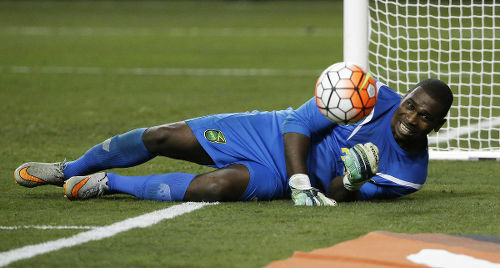 Photo: Jamaican goalkeeper Ryan Thompson grimaces after making a save for the Pittsburgh Riverhounds. 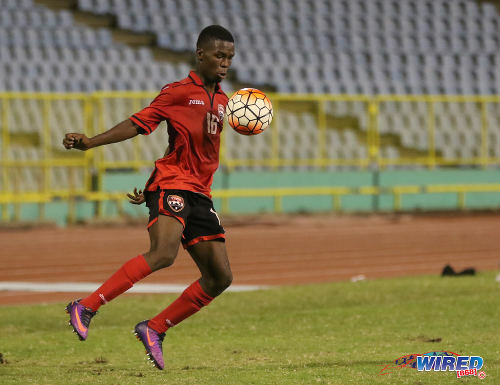 Thompson will represent Central FC at the 2017 Caribbean Club Championships. 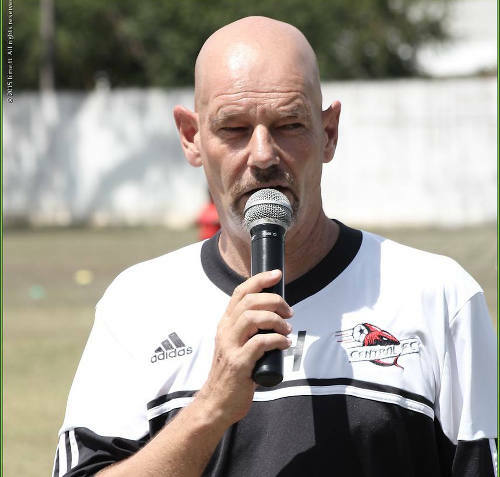 Photo: Central FC operations manager Kevin Harrison is also the former Advisor to ex-Sport Minister Brent Sancho. Photo: Antigua and Barbuda defender Vashami Allen. 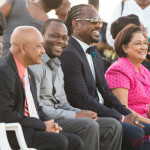 Photo: Central FC chairman and ex-Sport Minister and Brent Sancho (second from right) is flanked by ex-Prime Minister Kamla Persad-Bissessar (right) and former World Cup 2006 star and Central coach Stern John during the opening of the Irwin Park Sporting Complex in Siparia in 2015. 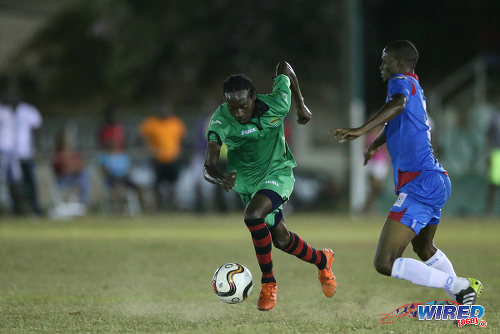 Photo: San Juan Jabloteh winger Nathan Lewis (left) tries to evade St Ann’s Rangers defender Shakiyl Phillip during Pro League action at the Barataria Recreation Ground on 2 April 2016. Phillip will also represent Jabloteh in 2017. Photo: Trinidad and Tobago National Under-20 Team midfielder Micah Lansiquot controls the ball during a practice game against St Ann’s Rangers at the Hasely Crawford Stadium in Port of Spain. 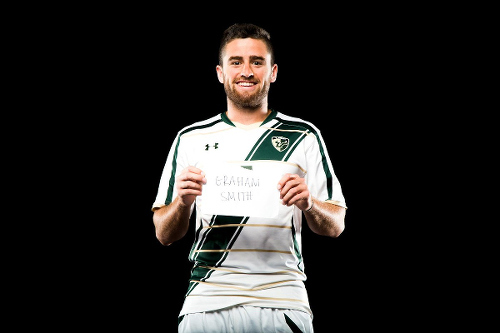 Photo: Former Pittsburgh Panthers defensive midfielder Graham Smith will represent Central FC at the 2017 Caribbean Club Championships. 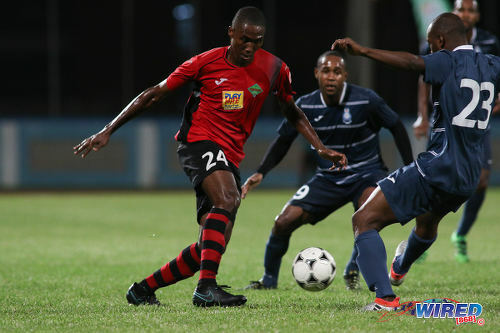 Photo: San Juan Jabloteh defender Adrian Reid (left) tries to force his way past two opponents during Pro League action against Police FC at the Ato Boldon Stadium on 1 November 2016. Photo: Defence Force striker Devorn Jorsling (left) chases Central FC midfielder Nathaniel Garcia during the Digicel Charity Shield on 10 September 2016. Cibao FC (Dominican Rep) vs Grenades FC (Antigua), Group A, 8pm. 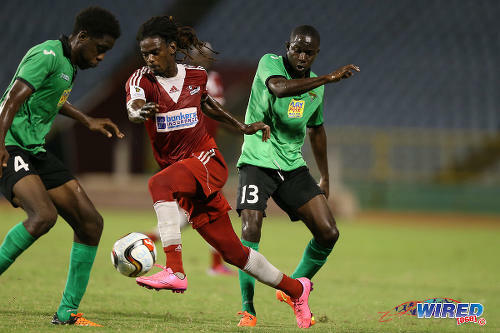 Photo: Central FC winger Jason Marcano (centre) tries to find a way past San Juan Jabloteh players Fabian Reid (right) and Garth Thomas during 2015 Pro League action at the Hasely Crawford Stadium. Group A winner v Group B winner, 8pm. Previous Dear Editor: Does T&T practice selective law enforcement? And what are the ramifications? What do we do about pretend agents who advise players to walk out of a contract to travel to a joke trial overseas and return without any work? Would that guy have received legal advice? These people must be kept away from football. How many employers tell you that you have succeeded in your job application, here’s your contract, take it to your lawyer, have a little think and come back to me? Meantime, every pro league club issues the exact same approved contract. The only difference is the front sheet which states length of contract, salary and any other tens such as accommodation (with free wifi and unlimited door keys if applicable) and clubs option to extend contract. If players need a lawyer to help them understand those items, then they can of course gain advice. And hence the reason why the English men/ local owners will always continue going to the banks smiling steeuuppss. Them really good yes. Half and hour to sign a contract come on nah man these guys need a agent to negotiate on they behalf. Did a search the other day Trinidad and Tobago has no registered agents for football the close one is in Barbados. Maybe Simone Ghirlanda can elaborate on this topic some more and plus I think that an agent also needs to have a professional football license the same as the professional Coaches eh. Earl Mango Pierre Very much registered for years now and via CBF, The rules have changed, much easier now for persons interested. I am reading and reading, and whilst we will be against all these clubs and their actions, the buck will stop with the players, if they cannot stand up for their rights, or allow themselves to be advised, then this treatment will continue. The players have to put a stop to any ill treatment. Earl Mango Pierre, Dion Sosa, you both know firsthand how conniving most players can be, will tell you one thing and do the exact opposite, overall, there is no integrity….. a pity that innocent and genuine players are caught up in this. FIFA removed license system over two years ago. Now anybody can intermediate on deals as long as they register with their association. In order to register you need to pass a criminal background check. No wonder these two individuals couldn’t run the professional players Association anymore because they wudda surely failed the criminal background checks so they just continues to exploit the players in our sweet country and abroad steeupsss. Them really good yes. 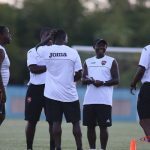 Does anyone in the TT Pro League besides he obvious care about the growth of T&T Football? Or is winning this Pro League the pinnacle of their thoughts? – Over the weekend I linked up with one of my faithful and loyal player for life and he was sharing with me about the ordeals that he had to endure while representing one of the professional teams in our sweet country and even when he left the team and the owner had to continue honoring his contract while representing another team the owner when the both teams met said to his players. Alyuh see that young baller there , he is the most educated baller that I have ever came across because he understood about the contracts etc, etc, and this is what I told him, well thanks to your education is the reason why they cannot bamboozled your thinking and your welfare eh . Them really good yes. So why some of the owners of the professional teams in our sweet country just cannot be honest and be full of plenty integrity when it comes to the welfare of our footballers in our sweet country. I wonder when will the lies and the exploitation will finally come to and end ? Them really good yes. Look forward to seeing the action. Each club would employ methods to treat with the reality of their situation. Sponsorship from league and club standpoint is difficult , Central has come up with a creative angle, one who is not faced with the wage bill at the end of month can afford to be cynical and scoff at these efforts. But those who put in the monies understand it. Guess they are implying the locals aren’t up to par? 12 foreigners? Sounds like a big mafia. I am almost certain, there will one day be a probe into these transactions- Hope it doesn’t affect our national team. That’s good marketing on Central FC Dion regardless of where they are from let’s see them represent the pro league team well? Might be time for Skeene and the TTPL to implement a cap on foreign players – Especially if dollars from government subventions are going to be used to pay them. We should also establish minimum criteria that foreign players should meet before being able to ply their trade in tnt. At minimum they should meet one of the following requirements: prior professional footballing experience; previously represented their country at the youth or senior level; played at the college level. You do realize it’s the T&T pro league we talking about right? There is a cap on foreign players in the Pro League. But this is a different competition. For me, one of the most curious things is that so many players might represent Central FC without being registered with the team in the local league. That is one of the things the Pro League might want to come to grips with. There is a cap? Can you share more? Are their minimum requirements they (the players) have to meet? No minimum requirements. I can’t remember if the cap is four or five foreign players. But Caribbean players don’t count as foreign I think. Jamaal Shabazz can help me out if he available. It can be hard to get info from the Pro League at times. Hi guys I suffering from preseason blues. Teams allowed 4 foreign players however as in the case of the European Union, a player from Caricom does not count as foreign. Getting your squad together and all the headaches associated with same. Right. Understood. Especially as players generally sign for one season. So plenty clubs have to build a team from scratch every pre-season. Actually there is a limit to number of foreigners which is confirmed each year. Caricom don’t count as foreign so you can play 11 Jamaicans if you like. Fortunately, all of our foreign players fit your criteria! All will be registered with Pro League. They just may not play! Local team/club in pro league…foreign team/club in CFU… interesting! Interesting question…How can this help to build your team locally? But still with plenty to pass on to our youths, S which they don’t get at moment. Thought you for one would see the positives in this. It does seem that Central are condemned for whatever decisions they make. 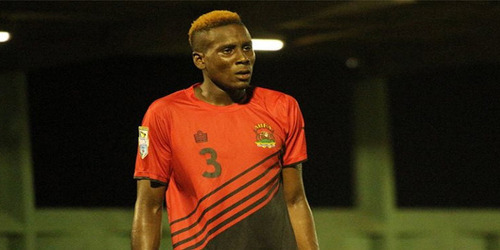 While every team looking to win CFU usually stacks their squad with short term foreign imports – including Jabloteh, Joe Public and W. Connection, Central publicly had a policy of 100% Trini wherever possible and, aside from Defence Force, are the only team to win CFU with a totally local 11 players. Now we’re trying something different. Bringing players who were at academies at Man Utd, Man City, Chelsea, West Ham. Players who played for Wolves, Sheffield United. Foreign internationals and exciting young Caribbean talents to supplement our local boys and help improve their professionalism. This should be creating a buzz where people want to come and watch the games and take a look. But instead, more criticism and idiot comments from predictable quarters. 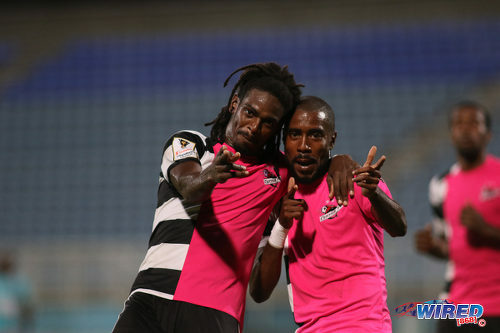 Jabloteh have foreigners, so why not criticize them? Is their no pride in a T&T club trying to make history? 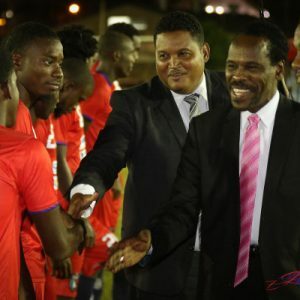 Is their no interest in trying to raise the standard of local football, which is actually more admired outside of T&T than by local football fans? People talk about Pro League being boring, poor standard etc. Yet we try to develop interest and it’s still negative? Steups. Central won the same tournament in 2015 with one foreign player, in 2016 with 0 foreign players. Most teams in the tournament routinely recruit foreign players just for this tournament. 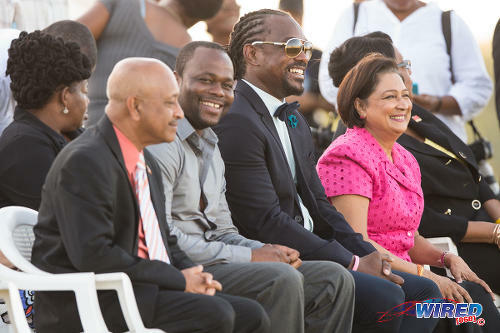 The Antiguan team has several Jamaicans, D.R. has several Haitians. This is the first time Central has ever had more than 3 foreigners on its roster to my knowledge. There is a limit to number of non caricom players allowed in Pro League, but not CFU. Does not also say “only if the job cannot be done by a local” ? So do our local Clubs care about the development of our youths, or just trying anything to win. Isn’t the purpose of having a professional League to raise our standards. What does it say if I can bring a legion of players for 30 days, every so often? That local players are not worthy of playing in the league. The league needs to make a stance on how many foreigners a team can play during the season. Yes, under the Immigration Act Ch 18:01 Reg. 10 (1) (c). Didn’t CONCACAF bump up the $40,000.00 to $70-80,000? And while it does seem like much…we don’t have direct airfare to most locations which puts Caribbean teams at a financial & logistical disadvantage. I spoke to CONCACAF press officer and he said US$40,000. Just realised that there is ambiguity as to whether it is US$40,000 for only the away team or if it is not for each team. Can you confirm Kevin Harrison? $40 is for away games. Just a correction: only the winning team qualifies for champions league in February. Runners up qualify for the concacaf league in August against Central American teams. Winner of that qualifies for champions league also. Similar to the Europa Cup. Updated. Interesting change. I like it. But hopefully the Caribbean goes on to have more than one place. What manner of madness is this? Isn’t there a limit to how many players you can list as squad players? Yes. But they haven’t crossed that limit. Clubs name a 20 man roster. That they can work for up to 30 days. Have 10 days in football too? Praying it works out for the players signing those super short term contracts..
A big, long, watery steups! I’d seek more clarification from the Govt and Pro League on that.